1. Your check engine light is on: Modern vehicles come with many control modules. The modules communicate with one another over a network. If one of the modules cannot communicate with the ECU, that module will set a diagnostic trouble code and turn on the check engine light. The computer will also turn on the check engine light itself, if it has an internal problem that is causing it to misinterpret data. 2. Your car won’t start: A vehicle needs three basic things to run: spark, fuel and compression. The ECU is responsible for the proper delivery of fuel and spark. On vehicles with variable valve timing, it also plays a part in maintaining proper compression. Because the ECU is responsible for all of these vital engine functions, a faulty one can easily prevent a vehicle from starting. 3. Your engine runs poorly or stalls: The ECU is responsible for everything from fuel injector output to emissions component control. As a result, a faulty computer can cause all kinds of problems such as an engine misfire, stalling, hesitation and surging. A bad ECU can also result in poor fuel economy and increased emissions. Considering how much technology has taken over the past 20 years, it should be no surprise that there’s a computer running your car. 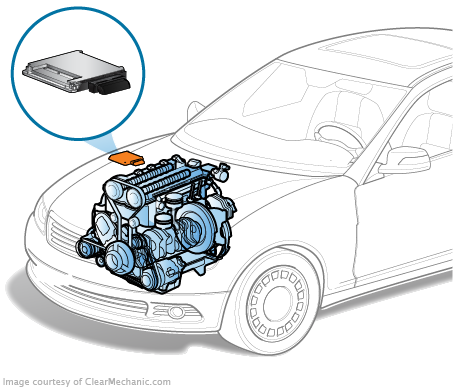 The engine control unit (ECU), also known as the engine control module or powertrain control module, is the computer that monitors and controls your car’s engine operation. It receives input from sensors throughout the vehicle and controls the fuel injectors, spark plugs and emissions equipment. The ECU also performs diagnostics on various systems and triggers trouble codes if it detects a problem. In some cases, you or your mechanic may be possible to reprogram a faulty ECU with new software. If that doesn’t work, you should get the computer should be tested, and potentially replaced. On many vehicles, it must be reprogrammed after replacement so that it can communicate with the rest of the vehicle. I have a 2000 ranger 3.0l flexfuel 4x4. where is the ecm located? and is it easily accessable? thank you for the help!